The Nikola Motor Company has so far been concentrating its pre-production efforts on hydrogen fuel cell trucking – in the shape of the One, Two and Tre. 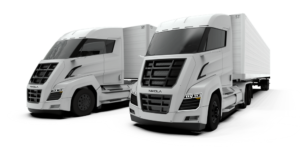 But a tweet late last week confirmed that the company is heading into shorter haul electric cargo transport territory with the announcement of battery electric versions of the Nikola Two and Tre. Story by Paul Ridden / newatlas.com.